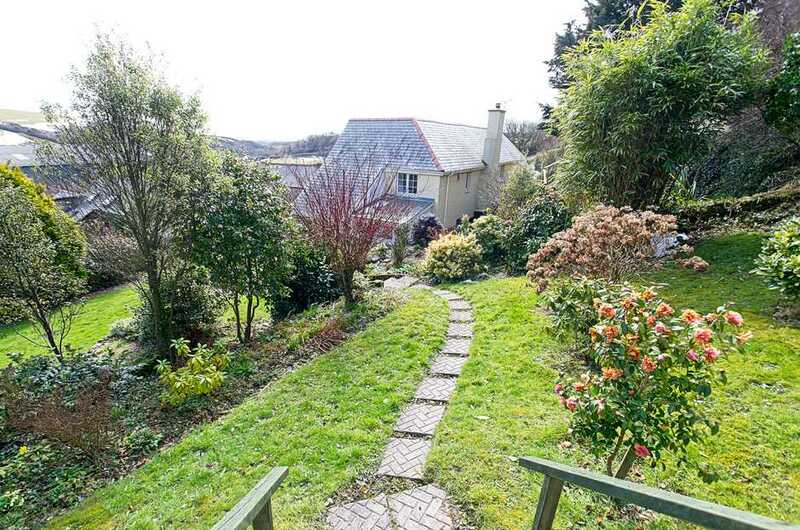 Just a little drive from Woolacombe is the enchanting Ivycott sitting in its own grounds of approximately 2 acres. Raised up from the roadside it enjoys far reaching views over farmland and neighbouring properties in the small hamlet. The huge driveway can accommodate parking for plenty of cars and once inside this 3 bedroom house there are several rooms for extended families to spread out. On entering through the front door, on the left is the neat sitting room with ample sofas seating 6 people and TV, books and games are available. The wood burner makes for a snug place to spend evenings with the family. There is a dining room with table to seat at least 6-8 and a cute ‘’snug’’ currently set up as a chill out room or playroom with a downstairs cloakroom with washing machine. Next to the dining room is a bright kitchen with modern off white units, full size dishwasher, oven, hob, microwave and food storage. It is fully equipped to cater for 6 people. A lovely picture window looks out over the tiered garden and there is a useful porch at the back door for boots/shoes. There is a kitchen table and a utility area housing the boiler and fridge freezer. There is a washing machine and tumble dryer. Upstairs there are 3 bedrooms, master with superking bed, wardrobes, bedside cupboard, chest of drawers and mirror. There is a lovely ensuite with shower, sink and wc. Next is a kingsize room and then twin room with zip n link beds (please indicate your preference to super king or 2 x singles on the booking form) with sink. There is a very sunny pleasant family bathroom with a separate shower. Outside is the amazing garden on 3 sides, tiered lawns, beds, raised deck, barbecue patio with summerhouse and views over farmland. Ivycott presents a wonderful family friendly holiday home within a short drive from the beaches of Woolacombe or Ilfracombe, Croyde and surrounds. It is positioned perfectly away from the madding crowds yet within easy access of the best of North Devon. A £20 dog fee is payable at balance stage. Saturday changeover.